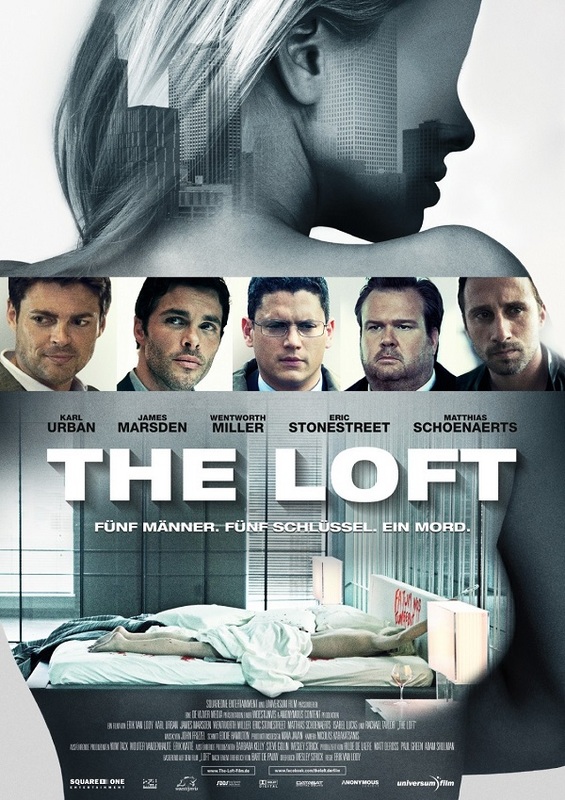 Despite an intriguing concept and an all-star cast (albeit rather B- than A-list), “The Loft” completely bombed at the US box office. And while it’s far from a great movie, it’s a decent enough thriller, and definitely undeserving of the cold shoulder that it was given by the majority of the movie-going audience. Granted: “The Loft” has a hard time living up to that great, promising premise: Five married guys who share an apartment for their extramarital affairs one day find a dead girl lying in the bed. Only the five of them have a key. Is there a murderer in their midst? It’s a fascinating idea, and even though some might have a hard time sympathizing with them given the fact that they’re adulterers, I managed to look past that (not least because I prefer flawed protagonists to infallible ones) and just go with it. And no matter if you’re able to relate to their actions and problems per se, “The Loft” raises some interesting questions about friendship; how much it can take, how good we can ever really know another person (no matter how close we think we are), and how far you’d be willing to go in order to help a friend – or destroy an enemy. Granted, the longer the movie the more far-fetched the revelations; the one coming after about 2/3rds of the movie is especially hard to swallow. And I’m pretty sure that when looking back with the knowledge that we have at the end, a scene at the beginning doesn’t really make a lot of sense (however, I’d have to watch the movie again to be absolutely sure). But overall, I had a good enough time with it to not care too much about that. “The Loft” moves along at a brisk pace, offering up new twists and turns every couple of minutes, as well as great performances from its five main actors as well as the supporting (mostly female) cast. Its one major flaw is the beginning, which yet again shows us a scene from far down the road. It’s a stylistic device that I get more and more weary of with every use, and here, it seemed especially unnecessary, if not downright stupid. Now, even though it gets widely overused nowadays, I kinda get the idea behind it: You want to grab the audience right away, before you start with the introduction of the characters etc. As much as I might not like it personally, I can see its sense and purpose, especially on TV, where you risk the modern, ADD-suffering audience switching the channel as soon as there’s nothing exciting going on for two minutes. Something that’s already not an issue in the cinema, but ok. However, in “The Loft”, they already had a very effective hook with the dead girl in the bed. Thus, the scene before that was completely unnecessary. Even worse, though, is that because of the shot of the glove and the fact that only one of the guys that find themselves on the balcony at the end is wearing some, you already know how this confrontation is going to end, which completely drains it of any tension. Thus, in this case, starting off with that shot was a completely amateurish move that hurts the movie considerably. Which – especially considering how easily it could have been avoided – really is a damn shame. This entry was posted in cinema 2015, movie reviews, new releases and tagged Eric Stonestreet, Erik Van Looy, Isabel Lucas, James Marsden, Karl Urban, Matthias Schoenaerts, Rachael Taylor, Rhona Mitra, The Loft, thriller, Wentworth Miller. Bookmark the permalink. Nah, you didn’t miss much. It’s watchable, but nothing special.